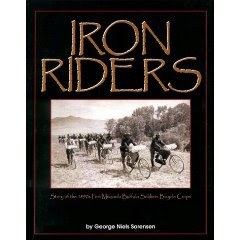 “We stopped over at the post a day to draw rations, clothing, etc., At 5 o’clock Friday evening, June 25, we mounted our wheels again and with a stiff head wind, made the Crow Indian Agency, twelve miles away, in two and one-half hours. As the evening shadows began to fall, there appeared amid the hills in the distance, a number of small, white tombstones—the silent resting place of Custer’s glorious band! Camp was pitched on the banks of the little Big Horn within a stone’s cast of a large wooden cross, on which is inscribed, “Here fell Custer.” Indeed, the surroundings of our little camp that night were replete with memories most sacred. The whole corps walked over to this “Custer monument”—a large piece of pyramid-shaped granite, bearing the names of every member of Custer’s command. A small, white tombstone marks the place where every man fell, the remains of the enlisted men having been gathered together and interred under the monument, while the remains of all the officers, save one where removed from the field and buried in different parts of the country. While a cadet at West Point, Lieut. Crittenden had told his father that if he were ever killed on the field of battle, he wished to be buried where he fell—and Crittenden now sleeps on the side of the lonely mountain! As we stood at the monument, trying to form some idea of the terrible sensation every man must have felt when he realized he had been trapped, and now stood face to face with grim death, the view was most inspiring. To the north [sic – that should be south] a prominent peak marks the location where Custer divided his command into three parts: to the far south could be seen the position occupied b Reno and his men, and at the very foot of the hill runs the Little Big Horn, on whose banks camped Sitting Bull and his warriors. What a change has time wrought! On the 25th of June, 1876, Custer and his men were massacred on a field of which civilized man knew nothing; on the 25th of June, twenty-two soldiers of the regular army are on the same ground with bicycles! In the valley below, where savages and buffaloes were wont to roam, corn grows, wheat is planted, a railroad passes and civilization prevails! -----Fort Robinson, July –[Delayed in transmission. ]—June 24th found the 25th Infantry Bicycle corps at Fort Custer, Mont., at which point a days rest was taken. At 4 o’clock on the evening of the 25th the corps again started on its long journey, having during their stay at Fort Custer discarded one half of their blankets carried up to that time. Crossing the big flat lying south of the fort, on a good road, except where several ravines are gouged in its surface we soon reached Crow Agency, eleven miles to our credit. A stop of a few minutes was made before the corps proceeded and advanced three miles further on where camp was pitched for the night. The site of our camp was on the flat at the foot of the hill on which Gen. Custer fought the famous battle and where the Indians pitched their lodges the day before the battle. Before getting supper the men visited the celebrated battlefield and viewed the site of the massacre with interest. The writer went over Custer’s very line of march on his bicycle under the direction of Mr. A. N. Grover the custodian of the Custer National Cemetary. It is something of note that on the 21st anniversary day of Custer’s last battle, troops on bicycles were viewing the grounds from their silent steeds, around which are bones, the remains of cavalry horses, which fell with Custer and his 230 men. The doctor, Lieutenant Moss, and myself ate dinner here, the first square meal we have had for some time. At Fort Custer had a good board but too dainty for our appetites. We will be out two weeks tonight and have one-third of our journey accomplished. The roads through the alkali districts of this state are as hard to travel over as are the sand hills of western Nebraska, but after that our way will be smoother sailing. June 25th was the 21st anniversary of the Custer massacre. By good fortune we were right on the historic spot at that time. I was never more interested in anything, and followed Custer’s line of march from where the first man fell to the place where Custer and his noble men made their last stand. It is too long a story to tell as a great deal is only supposition. The corps camped at the foot of the hill below the battle field and nearly all the boys took in a little of the sights. The relics have all been picked up, even the stone which marked the fall of Custer has been carried away until absolutely nothing remains. A wooden cross now marks the place where Custer and his noble men made their last stand. It is too long a story to tell, as a great deal is only supposition. The corps camped a the foot of the hill below the battle field and nearly all the boys took in a little of the sights. The relics have all been picked up, even the stone which marked the fall of Custer has been carried away until absolutely nothing remains. A wooden cross now markes the place. Our road across the Crow reservation was a hard one, and we are glad we are over it, and out of the state of Montana as well. We have not had a whole day of good weather on our trip, rain is always sure to mar the day's run. You can reach me with letters and wire for a few days to Edgemont, S.D. and then at Crawford, Nebraska. The flowers in this part of the country are much prettier and more varied than are to be seen at home. Red, pink and white wild roses are to be seen on all sides. A flower much like the Montana Arnica flower, having pink leaves, are to be seen in abundance. They are pretty and have a nice odor. The enclosed bill of fare will give you an idea of what we filled up on. Moss had three pieces of pie. Will have to get at my article now, so good bye, Your son and brother. 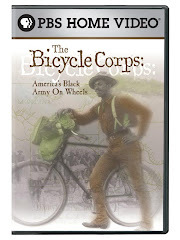 MILITARY BICYCLE CORPS. CROW AGENCY, Mont., June 25. – The Twenty-fifth infantry bicycle corps, Lieutenant Moss in command, is camped for the night a few miles south of this place. All are well and in good condition. Good roads are ahead for two hundred miles. The average has been nearly sixty miles per day to date.